Bed bugs are parasitic insects that feed entirely on blood. Adults are light brown to reddish brown in color. Bed bugs are flat, round and grow up to 4-5mm long. Newborn bed bug nymphs can appear clear in color and may have bright red abdomens from newly consumed blood meals. Bed bugs primarily feed on humans and thrive in areas where people live. Bed bugs can also feed on other mammals such as birds, rodents, chickens and house pets. When infested inside residential homes, bed bugs will choose to hide in tight fitting locations close to areas where people sleep. Bed bugs feel protected in areas that are snug and difficult to access. They are notorious for living between overlapping pieces of fabric on bed mattresses and bed linens. They can also live behind picture frames, bed frames, bedside tables, closets, couches and even inside electrical outlets. Bed bugs live in isolated locations making traditional pest control methods difficult and sometimes fruitless. Bed bugs must past through 5 stages before reaching full maturity. They reach the final adult stage within two months of first hatching. The bedbug will shed its exoskeleton between each stage, allowing it to mature and expand in size. Female bed bugs can live up to ten months and can produce up to 500 eggs during their entire lifespan. Bed bugs feed exclusively on blood from animals, preferably humans. Bed bugs typically search for a new blood meal every 5 – 7 days. 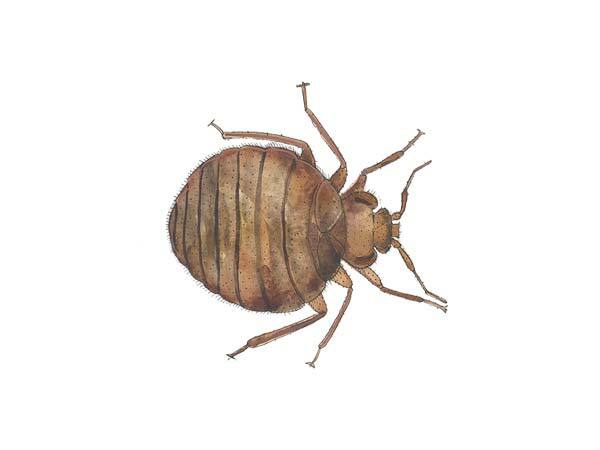 Once a bed bug consumes a blood meal, it returns to its hiding place to seek refuge. Bedbugs are adverse to light and only leave their sheltered area to seek blood during the nighttime. They find their host through detecting heat and carbon dioxide that is produced by all oxygen-consuming animals. When feeding, bed bugs use a sharp mouthpiece to pierce the skin and then inject anesthetics, masking the pain allowing it to drink blood undetected. In the beginning stages of a bed bug infestation, very few people will experience severe symptoms from their bites. Once an infestation is in full swing, many individuals report severe itching and reddish colored lesions or welts around the affected area. After a few weeks the swelling and redness should dissipate. However, some people can develop skin infections due to severe scratching induced from bed bug bites. Seek medical attention if any abnormal health conditions persist. First, try to identify live bed bugs. Bed bugs like to hide in tight and secure areas around the house, especially around the edge of the mattress where the fabric overlaps. Look for dark spots. Bed bugs leave behind excrement resembling dark specks. These dark spots are located in areas where bed bugs frequent the most, usually around furniture. Bed bug eggs are very small, around the size of a pinhead. They can appear translucent or pear white in color. Bed bug eggs are usually grouped together in small batches where beg bugs congregate. Bed bugs are one of the most difficult pests to eradicate with traditional pest control methods such as pesticides or natural insecticides. Bed bugs can hide in places where chemical products cannot access such as electrical outlets, wall voids and behind cabinets. Bed bugs can survive up to 400 days without feeding; therefore females may remain hidden and produce eggs without making contact with pest control products. Tent fumigation has proven to be 100% effective against eliminating all stages of bed bug life. Tent fumigation involves the careful use of a structural fumigant called Sulfuryl Fluoride, otherwise known as Vikane gas. Vikane gas is non-flammable, non-corrosive, does not leave an odor and will not leave a surface residue. Vikane gas quickly penetrates structural materials including wall voids, furniture and attics. Vikane gas prevents insects from metabolizing the stored fats they need to maintain a sufficient source of energy for survival by disrupting the glycolysis cycle. The result is 100% elimination of all stages of bed bug life, including the hard to control egg stage. Cloud Termite & Pest Control has been serving Bradenton bed bug control and Sarasota bed bug control since 1934. We are available to assist with all your bed bug problems. We service Bradenton bed bug control, Sarasota bed bug control and surrounding areas.